I was fascinated with dictionaries as a child. Not just the traditional ones, full of obscure words and mysterious meanings, but the great dictionaries of history, the illustrated medieval texts and secret alchemical treatises. A dictionary is as much a celebration of type as it is a stage for words and meaning. Letters and typography have their own magic, and as I started planning my own book, I wanted to bring that power to life in a new way. I first met Gemma O’Brien some years ago, when I had just finished writing my first book, Futuretainment. I needed someone to help me re-imagine my brand identity. Gemma had become somewhat of an online celebrity after a video of her covering her entire body with hand-lettered typeface had gone viral on YouTube. Asking her to design my logo and my early slide presentation templates was a criminal abuse of creative talent - but I did it anyway. 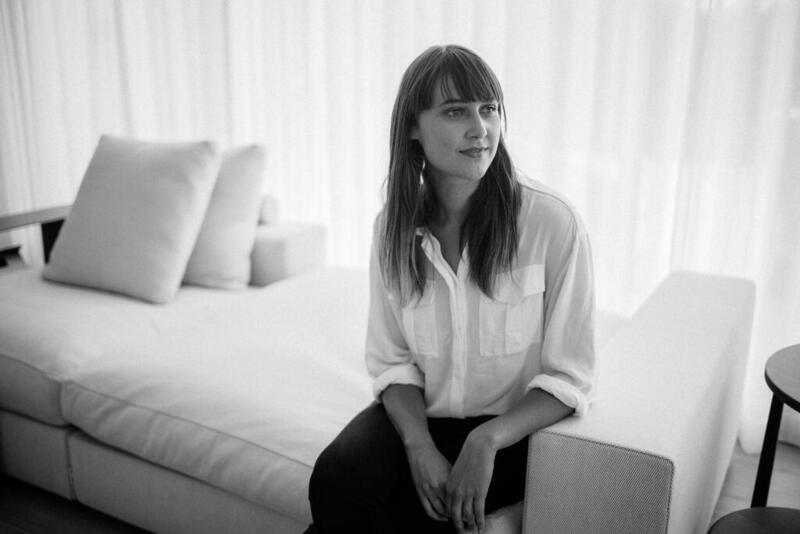 Since then, Gemma has found much more useful things to do - working as an art director at Animal Logic, Fuel VFX and Toby and Pete before deciding to fly solo as a commercial illustrator. Her typographic work spans many forms from calligraphic brushwork, illustrated letterforms and digital type to large scale hand-painted murals. In 2014 she was recognised by The Type Directors Club in New York with an Award of Typographic Excellence. When I briefed her on The Dictionary Of Dangerous Ideas, I explained that I was trying to create an illustrated dictionary of provocative contemporary questions and wanted a custom typographic language to accompany them. The letters should convey a sense of displaced timelessness, as if referencing concepts conceived by society in a parallel universe where Charles Baggage had built his difference engine, where the Google founders had never met, and where a similar but strangely different technological ecosystem had unfolded. Someone she managed to translate that mad brief into a fantastic imaginary alphabet. What led you to be so inspired by typography, and why do you think it is such an important part of the way we think about design? Gemma: I became passionate about typography when I first started studying design and experienced setting metal type by hand in a letterpress studio at my art school. Prior to this I had only seen typography approached in design education through the drop-down font menu and the myriad of rules relating to font selection, kerning, line spacing etc (which I initially found very boring!). The experience in the letterpress studio was different though - the letters were physical and working with tangible metal forms was a much more exciting way to learn the rules of typography. From this point forward I became obsessed. I would document letters in my surrounding environment, fervently studied the history of typography and began learning the basics of lettering and calligraphy. Typography continues to inspire me because it’s intrinsically linked to language, culture, place and human experience. The way words are visually represented – whether it’s a professionally designed sign or a hand-written garage sale notice – can communicate so much beyond the content of the text itself. Typography is an important form of design because just like language will change over time, so too will the ways we represent it and this will continue to be influenced by new technology and ever-changing modes of reading and visual consumption. What are some of your the main influences on your work? Gemma: Sources of inspiration are constantly changing depending on the project I’m working on or my interests at the time. One constant source of inspiration is the typography and lettering I see when I travel. From hand-painted signage on forest walking tracks in Japan, to the neon hotel signs in Los Angeles, and the Fraktur street signs in Berlin, new cities can be a wealth of different styles influenced by the culture and history of the place. I love looking in old, second-hand book stores for vintage book covers and records for interesting type treatments too. There’s also many contemporary designers and artists today who push the boundaries of lettering, calligraphy and typography. I love the work of Luca Barcellona, Ken Barber, ilovedust, Alex Trochut, Seb Lester, Erik Marinovich and Martina Flor. What was your inspiration behind this project? 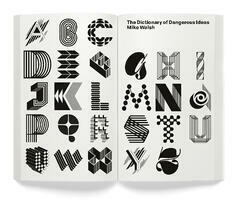 Gemma: The set of letterforms in The Dictionary of Dangerous Ideas were inspired by a nostalgic, geometric aesthetic. Trademarks from the 1970s and logos along with Swiss style book and magazine covers provided the starting point for many of the designs. 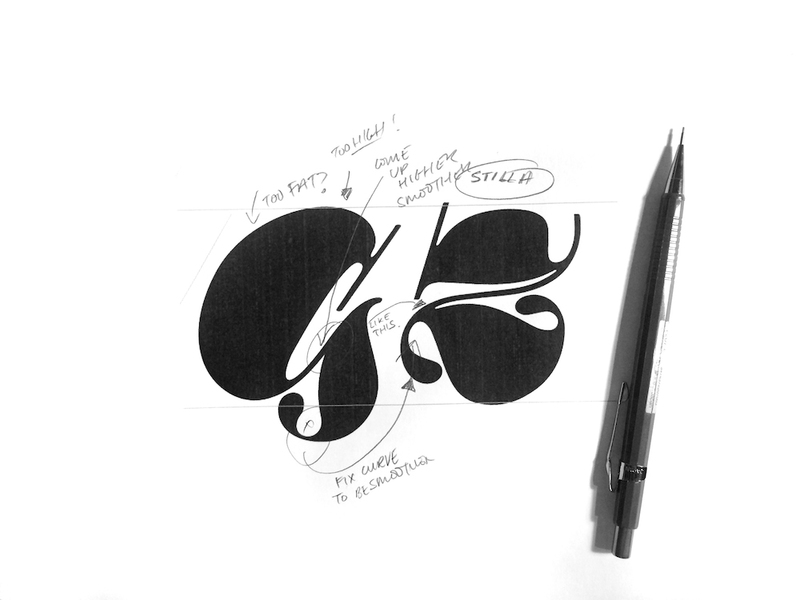 Some letterforms were created from scratch while others used existing fonts as a starting point. For example, the “z” (from the fat face Didone Stilla designed in 1973) was the inspiration for the “g”. I thought these two bold quirky forms added some character to the set which is largely characterised by interlocking shapes, repeated lines, geometric shapes and isometric extrusions. What are some of the coolest things you have been working on lately? Gemma: It’s been an exciting year for me in 2014 with my time split across commercial commissions, gallery shows, talks and workshops. I recently collaborated with QANTAS on their Blank Canvas Campaign, I designed the word mark for Angus and Julia Stone’s new album and I have been working with Volcom as an artist ambassador to create some large scale murals. I recently just got back from Adobe in Salt Lake City where I presented a keynote talk, hosted a lettering workshop and created an artwork for their HQ. What is one of your dangerous ideas? Gemma: I strongly believe that visual communication and design thinking is something that should be taught as a basic part of education alongside language and literacy. Although it can often seem trivial to discuss things like the ways colours influence us or the way a font choice may be sending the wrong message, at the end of the day everything is designed. The world around us might seem natural, yet when you dig deeper you see how these designed forms are shaped by wealth, culture, politics and power. The forms of visual design in our daily experience are embedded with values and are a key part of the cultural forces that shape our behaviour. Rather than separating design thinking to the fields of graphic design, product design or architecture, ideas about how aspects of these fields are directly linked to how we think and live should be something that is embedded from an early stage within the various of disciplines of education.